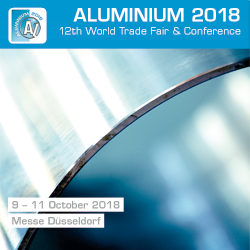 Group Talum is exhibiting at Aluminium trade fair in Düsseldorf, Germany from 9th to 11th October. It si one of the world's leading aluminium industriy trade fairs that covers entire chain from raw materials to semi-finished and finished aluminium products. Focus topics of Aluminium 2018 are e-mobility, sustainability, digital manufacturing and lightweight tehnologies. Trade fair takes place in six halls, that cover an area of 80,000 square maters, hosts more than thousand exhibitors from all over the world and is expected to attract more than 27.500 visitors. Visit us at Aluminium 2018 and get to know Talum as a Producer of foundry alloys, billets, slugs and discs, castings and roll bond heat exchangers and as a provder of service and engineering solutions. Visit us in hall 10 at booth 10E113! The Battery Show 2018 in Hanover has ended. In Talum's subsidiary Talum Izparilniki d.o.o. they are satisfied with the attendance at their booth as they have established many promising business contacts. They are ready for new projects with existing and new business partners, thanking everyone that visited them at the fair and showed interest in their products and innovative solutions. 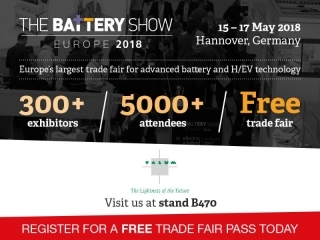 We are pleased to invite all our valuable partners to the The Battery Show 2018, co-located with Electric & Hybrid Vehicle Technology Expo, which is Europe’s largest trade fair for advanced battery and H/EV technology. Taking place from 15 - 17 May 2018, in Hannover, Germany, it will host more than 300 manufacturers and service providers from across the supply chain, who will display thousands of design, production and manufacturing solutions, including battery systems, materials, components, testing and recycling, for industries including automotive, utilities, renewable energy, grid, power tools and electronics. Find out more here. At the booth B470,we will present our efficient cooling solutions for EV battery packs with a Roll-Bond heat transfer plate. We will be pleased to explain you all the details. For free pass to the exhibition and for the organization of the meeting with us at our stand, please contact us at: franjo.skuber@talum.si . Running parallel to the exhibition, the three-track conference delves into the most prominent industry talking points – from the next frontier in vehicle electrification to optimising battery efficiency and performance through energy recovery and electric turbocharging. We very much look forward to seeing you this May in Hannover! 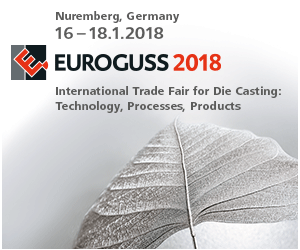 Visit us at Euroguss 2018 international trade fair for die casting in Nuremberg, Germany, which will be held from 16 to 18 January. Talum is located in Hall 7A at stand 7A-513. TALUM d.d., business unit Aluminium, organized and hosted the 13th AP18 Club meeting between 6th and 9th June. 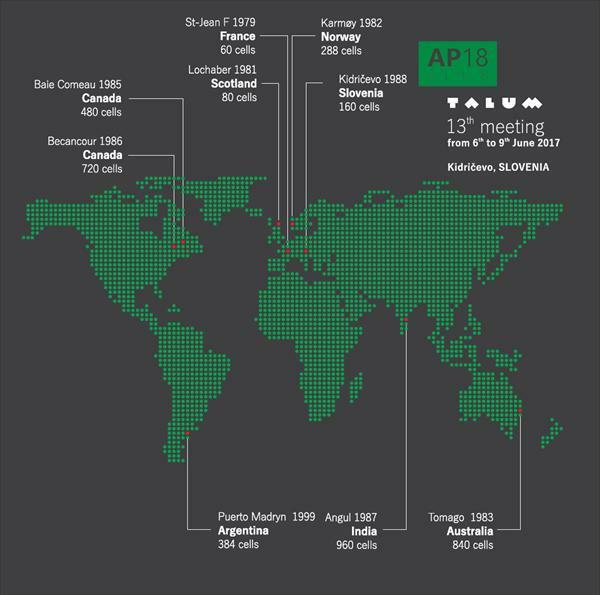 Members of the club are aluminium smelters from all around the world that use the AP 18 technology for production of primary aluminium, developed by Aluminium Pechiney. Representatives of various companies from Australia, Canada, France, Norway, Scotland, Argentina and India presented latest findings in their professional field and shared experiences during the conference which took place in hotel Primus in Ptuj. Our guests also took tour of production of aluminium, castings, slugs and discs and foundry alloys and visited Talum Inštitut d.o.o. They also had opportunites for sightseeing the Podravje region of Slovenia in the afternoons. This year Talum celebrates its 62nd Factory Celebration that, among everything else, marks also the 20th anniversary of the fall of the clapped-out factory chimney. The three-day event will begin on Thursday, the 17th November, at 10 o’clock a.m., when we organise the meeting with the retired co-workers in a big hall of a restaurant Pan. On Friday, the 18th November, at 1 o’clock p.m., a joint ceremonial session will take place. The Talum’s Management Board, the directors of subsidiary companies and business units, heads of the services, members of the Works Council, members of the Employees Council and members of the Syndicate Conference Kidričevo, will attend this event. In a lobby of the administrative building, you will have an opportunity to see an exhibition of fine art works of an artist Dušan Fišer. In the big hall of the restaurant Pan, socialising of the employees of the group Talum will begin at 3.30 p.m. The socialising will be introduced by the ceremony of the highest awards given to the employees for their achievements – Zlati metulj (Golden Butterfly). On Saturday, the 19th November, we will conclude our Factory Celebration with a traditional doors open day. To everyone, who wants to see the production in our halls and to meet all its variety, we open the factory, which actually represents a small town. Before the tours, we will gather at 9 o’clock in front of the administrative building. The guided tours will begin after a chairperson of the board Mr. Marko Drobnič gives an introductory speech. 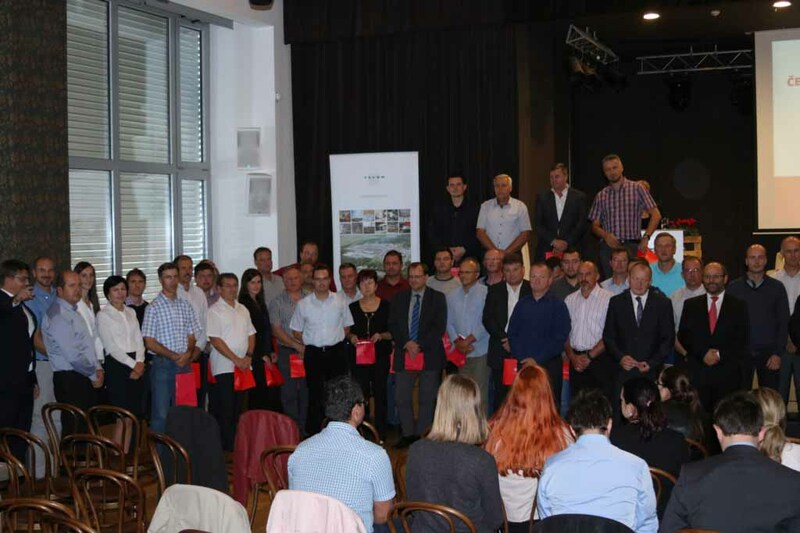 Yesterday at 7 o’clock p.m., the first ceremony of giving a title The Best Company of the year of the Podravje Region took place in Narodni dom in Maribor. It was organised by The Styrian Chamber of Commerce and a newspaper Večer. A ceremonial guest of honour was dr. Miro Cerar, Prime Minister of the Republic of Slovenia. 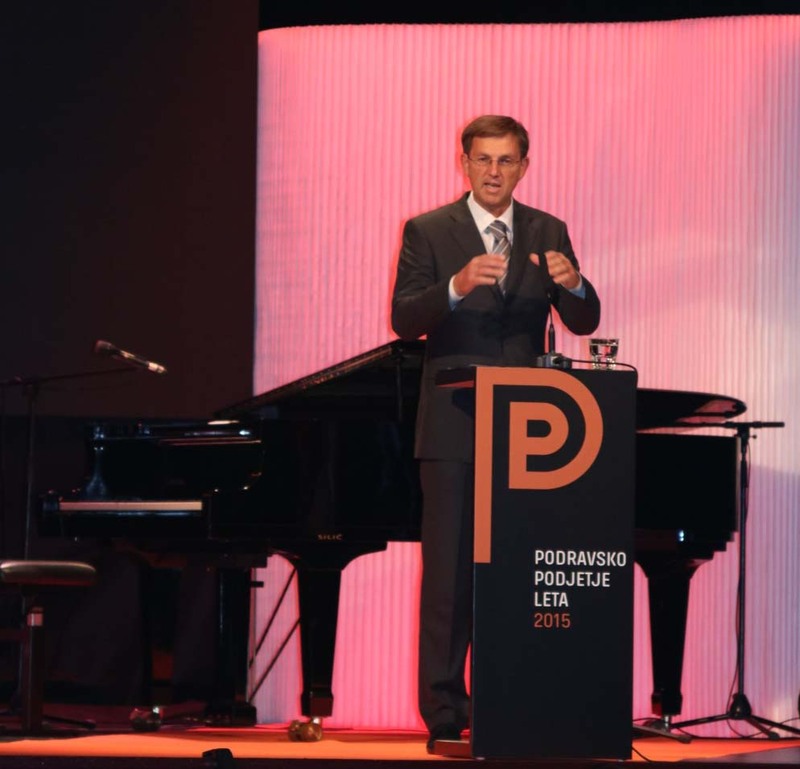 The premier praised economy progress of the recent years in the Podravje Region and appealed successful companies to be the role models for others. Neisha, a Slovene singer, spiced up the event with her music inserts. 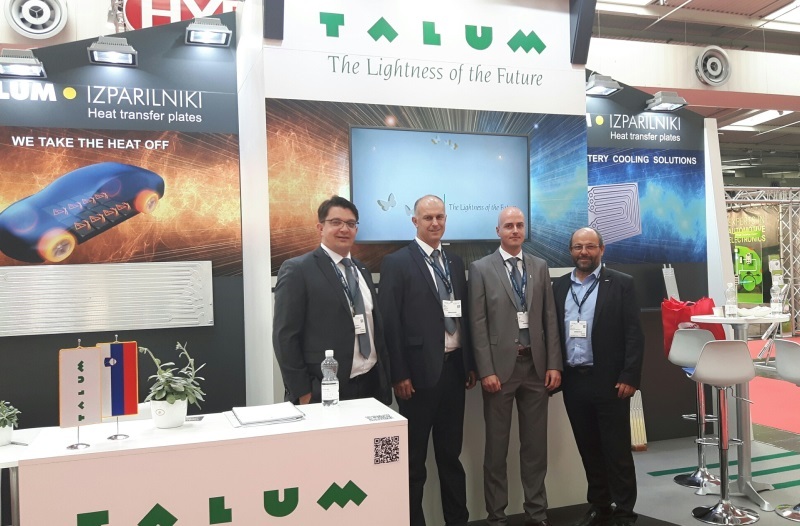 A member of the management board of Talum d.d., Mr. Daniel Lačen, attended the event in the name of Talum. 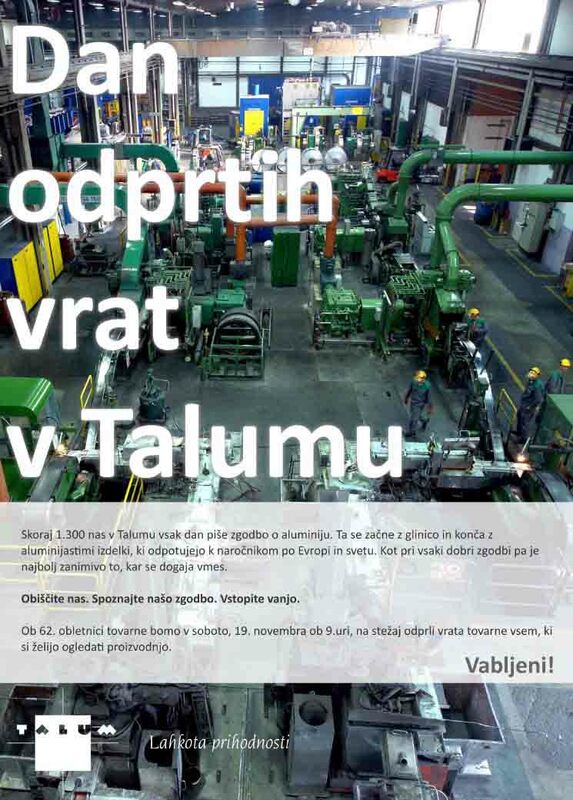 According to a selection of the expert commission, the group Talum was ranked on the third place in a category The Best Company of the Podravje Region. Such a high placement is a praising achievement since the competition in the category of big companies was very fierce. We understand it as recognition that we can keep up with the best and as stimulation to be even better. Work in this field – from developing an idea to planning its realisation – runs constantly, and once per year we present our endeavours to others. On Wednesday, 21st September 2016, in a big hall of the restaurant Pan, already the fifth traditional Day of Innovation took place. At this event, we presented and awarded achievements in the field of innovation of the previous year. We awarded three innovators from the field of massive innovative activity of employees, 46 of them for a professional innovative activity and five within a contest I Dare, which this time ran under a slogan Efficient at the working place. Better ideas break in situations when different aspects and ways of thinking are interlaced. Therefore, as it is already our habit, we invited an interesting guest to this event. This year our interlocutor was dr. Jožica Rejec, a chairperson of the managemen tboard of the company Domel. A top-notch saxophone player Oto Vrhovnik diversified the Day of Innovation with his music inserts. At today’s regular meeting of the assembly of the company TALUM Tovarna aluminija d.d. Kidričevo, shareholders, after being introduced with the Yearly and Consolidated yearly report of the company for the year 2015, gave discharge to the Board of Trustees and the Management Board of the company, and thus confirmed the work of the Board of Trustees and the Management Board of the company for the previous business year. The shareholders appointed an audit firm DELOITTE REVIZIJA d.o.o. from Ljubljana as the auditor for accounting reports of the current business year. Three shareholders, holders of 94,63% of total capital of the company, attended the today’s meeting of the assembly. The Management Board of the company Talum d.d. Opening the assembly and realising quorum. Election of the assembly bodies and confirming the agenda of the meeting. - Slavko Škerget and Ivan Ogrinc as counters of votes. Introducing the assembly with the Yearly report and Consolidated yearly report of the company for the year 2015 and with the Report of the Board of the Trustees of the company according to the Article 282 of the Companies Act. Only those shareholders (only these may vote) may attend the meeting assembly, who are on the cut-off date, i.e. 31st July 2016, registered as shareholders in a share register of the company, which is run at the central register of dematerialised security (KDD d.d. Ljubljana); and those shareholders who confirmed their attendance at the assembly meeting in a written form by the end of the stated day the latest. The assembly is quorum and decisions shall be valid, if there is 15% of the capital represented at the assembly meeting. If the assembly is not quorum at the predicted time, it shall be waited for 1/4 of the hour after the firstly defined time. After this time the assembly is quorum regardless the height of the represented capital. The shareholder(s) may, within 7 days after the call has been announced, require the amendment of the proposed agenda in accordance with the first paragraph of the Article 298 and /or the announcement of the opposite proposal, which is given in accordance with the first paragraph of the Article 300 of the Companies Act. All reports and proposals regarding the agenda of the meeting are, from the day of the announcement of the assembly call until the day of the assembly meeting, accessible for the shareholders and available for the insight at the registered seat of the company in Kidričevo, Tovarniška cesta 10, each working day from 8 a.m. to 1 p.m. The company will pass the reports, proposals and corresponding explanations to the shareholders within 3 days from the day of receiving the shareholder’s requirement for passing them. In accordance with the Article 305 of the Companies Act, the shareholders at the assembly meeting may require from the Management Board of the company the data, which is needed for estimation of individual items of the agenda. The Management Board of the company TALUM Tovarna aluminija d.d. Kidričevo, Tovarniška cesta 10, Kidričevo, is announcing an entry of increase in share capital based on the Article 341 of the Companies Act. The District Court in Ptuj entered the amendment of the share capital at TALUM Tovarna aluminija d.d. Kidričevo, reg. No. 5040868000. The amount of the share capital up to this point: 22.002.696,42 EUR. A new amount of the share capital: 22.356.587,64 EUR. A number of shares: 5.361.292 shares. Data on height of issue amount, data on increase in share capital with proper input and an auditor report on the proper input are evident from documents submitted to a register body, when the agreement on increase in share capital is entered.